At Junk Happens, we understand that it can be very difficult to clean out junk and debris from your home. Whether you’re trying to get your home in better condition because you’re interested in selling it, or are cleaning out the property of a loved family member, getting professional help is a great way to tackle all of the piles of junk, old furniture, and even yard waste you currently have. Instead of spending all of your time running back and forth to the dump, when you call us for service, you can rest easy knowing that all of your junk will be removed quickly and efficiently, leaving you with a clean home and yard that you’ll love. We know how stressful it can be when a loved one dies, and cleaning out their home is not only time-consuming, but can be emotional as well. 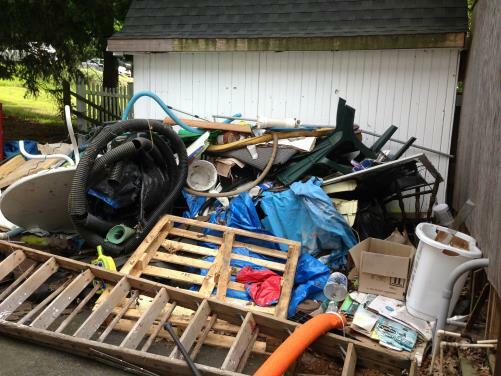 There’s no reason that you have to complete the task of junk removal in Bloomington MN by yourself. Not only will you have to miss work to complete this project, but tensions are sure to run high between family members. When you hire us to come and do the job for you, you can rest easy knowing that the home will be cleaned, all of your unwanted items will be gone, and you’ll be left with family heirlooms and treasure. Another great reason to call us for junk removal in Bloomington is if you are landscaping or cutting down a lot of brush and debris in your yard. At Junk Happens, we are thrilled to come and pick up your branches, leaves, and brambles and haul them off for you. No matter if you have ripped out your old deck and need to get rid of the boards and rusty nails, or simply cleaned out an area in the woods for a path and gazebo, you can count on us to provide quality junk removal service in Bloomington MN and to get rid of all of your yard waste and trash for you. As exciting as it is to get new appliances, hauling your old ones off to the dump is a pain. We are happy to remove your appliances for you as part of our cheap junk removal in Bloomington, and we will recycle every appliance we pick up. We know how important it is to take care of the environment, and our employees are trained on how to carefully remove appliances and recycle them. You don’t have to face junk alone. It can be very overwhelming to try to do so, so call us for professional help you can rely on. We’re ready to come to you and help with removing furniture, construction debris, commercial junk, and anything other kind of waste. How to schedule an appointment for junk removal in Bloomington? Call 612-333-5865 or book online at www.junkhappens.com to receive immediate junk removal assistance. You can also text us for a quote and send pictures of your unwanted items to 651-242-6783. Inform the date and time you would like to schedule the junk pick-up and provide other necessary information needed. Our professionals will call you 15 to 30 minutes before arrival and the customer should be required on site when the truck arrives. If you are unable to be on site, the team reviews the trash and determines pricing on arrival and calls you for confirmation. Upon arrival, we will provide you with a junk hauling estimate, remove your rubbish, and clean the area to your satisfaction. By scheduling our junk removal service online, you can get up to $10! What kind of tools do your trucks carry? Our trucks at Junk Happens are some of the largest in the area compared to other junk removal service in Bloomington MN. Our trucks can hold 18 cubic yards waste whereas the trucks of our competitors are only 14.8 cubic yards. Yet, we charge only for space you actually use in our truck. Our trucks are equipped with strong and efficient team members, shovels, rakes, brooms, sledgehammers, wheelbarrows and hand trucks. Who can make use of your junk removal in Bloomington MN? Homeowners who are looking to dispose of used furniture and old appliances, and have a space that has been over-run with junk. Landlords who are searching for ways to clear out an apartment or condo unit for the next sale or tenant. Realtors who have a client who needs a quick clean out. People with hectic schedules who do not have enough time to donate used items or move junk to the nearby recycling units. People who are in need of emergency junk removal and clean up. What materials can you take away? · Roofing items such as tiles and corrugated iron and more. Are there any items that Junk Happens can’t take? Yes, we do not accept any hazardous waste materials such as toxins, paint, animal waste, and more as we are not licensed to carry hazardous materials in our trucks. For help with disposing of any hazardous materials, call your local city recycling center.